Looking For a Skilled Painting Contractor in Ringgold, GA? If you’ve lived in the area for some time, then you realize that there is a Ringgold painting contractor that’s just waiting to become your new choice contractor for interior and exterior house painting services. 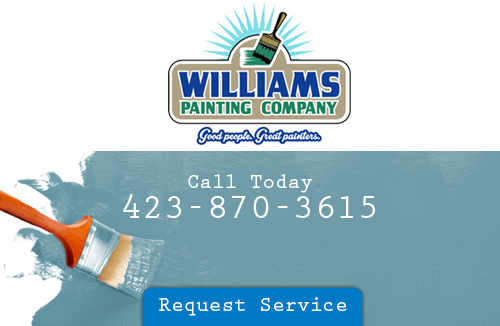 If you haven’t heard of Williams Painting Company before now, then call us as we’ll be able to answer any questions you may have about our services. We’ll help you find the right painting service for your Chattanooga home, from faux finishing to deck staining and more. Georgia may be known for their college football, but they are also know to have good painting contractors. After all, who do you think makes homes look so good? Area homes that were once in need of a good exterior painting took advantage of Williams Painting Company. Now those homes are looking great and being sold for a lot more money than they were once worth. There isn’t much that our house painters can’t do at Williams Painting Company. Call us for a free consultation and you’ll quickly see. Your home is going to be improved 100% through our painting services. It doesn’t matter if you need an interior or an exterior painting done. We can do it for you. Make the call and you’ll be doing yourself a huge favor. A house painter who is professional in manner and always on time should be the one that you hire to paint your home. Williams Painting Company doesn’t just employ house painters, we are the Ringgold house painting contractor that employs life changers. We can change your life through our painting. Think of how dull your walls look right now and then think about how much life that they’ll have in them after we’ve gotten to them. You won’t be able to stop talking about what a great job we’ve done to your home. Take advantage of our house painters today and you’ll never turn back. We know that you’re going to appreciate all that we do as we don’t just stop at house painting. We go the whole nine yards as we also offer other home improvement services. Day in and day out, your home’s exterior takes the brunt of the hit from the sun, rain and mud. You can’t just simply wash this off with a soapy rag and lots of hot water. You’re going to need a professional to help you. Why hire on a professional? The questions should be why shouldn’t you hire a professional? You’ll get your home’s exterior cleaned off with a solution that’s geared to take it and leave it off. Homemade solutions only work temporarily as they incorporate some type of dish washing liquid. You’ll find that we are the Ringgold pressure washing contractor to rely on in order to bring a lot more curb appeal to your home. You wont your home to shine don’t you? Call us for a scheduled appointment. If you are looking for a Ringgold painter, please call 423-870-3615 or complete our online request form.